BS 8102 2009) for the large underground car park which will serve both buildings. The watertight basement measures 80m x 70m x 4.5m deep and is constructed from 2,000m3 of concrete incorporating Triton’s Super Admix to form the ring beam – which can be seen in the photograph sitting on top of contiguous piles – the floor slab and the concrete liner wall. Triton Super Admix is a specialist chemical treatment for the waterproofing and protection of concrete – designed to be used as an admix at the time of batching. The active chemicals react with fresh concrete to generate a non-soluble crystalline formation which seals the concrete itself against the penetration of water or liquid, inhibiting the ingress of water through small cracks, shrinkage etc. and protecting it from the deterioration effect of harsh environmental conditions. Triton’s technical team worked closely with concrete suppliers, Cemex, and recommended a dosage rate of 4.1kg of TT Super Admix per 3m3 of concrete. 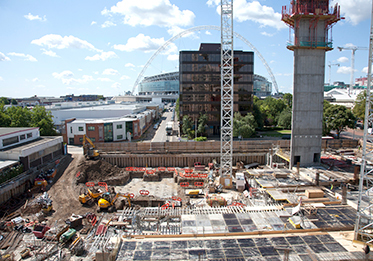 Triton continued to provide support and advice to the main contractor and concreting sub contractor (JNC Utilities) as the job progressed. Triton TT Waterstop (a water bar) and Triton TT Swellseal Mastic, was applied to all concrete construction joints and concrete interfaces. The application of these products was also overseen by Triton’s technical team who monitored and recorded the application of every waterproofing element of the basement’s construction up to ground level prior to providing a warranty on the system.